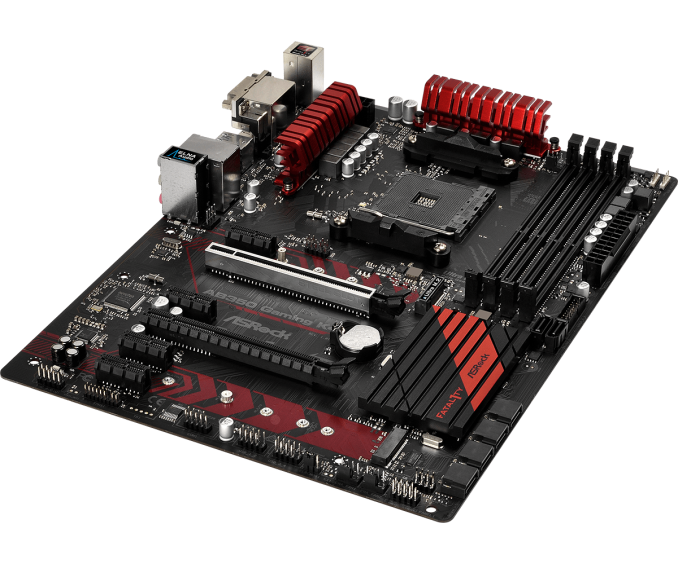 A low-cost alternative for Ryzen systems to the high-calibre but higher-cost motherboards is the B350 range. 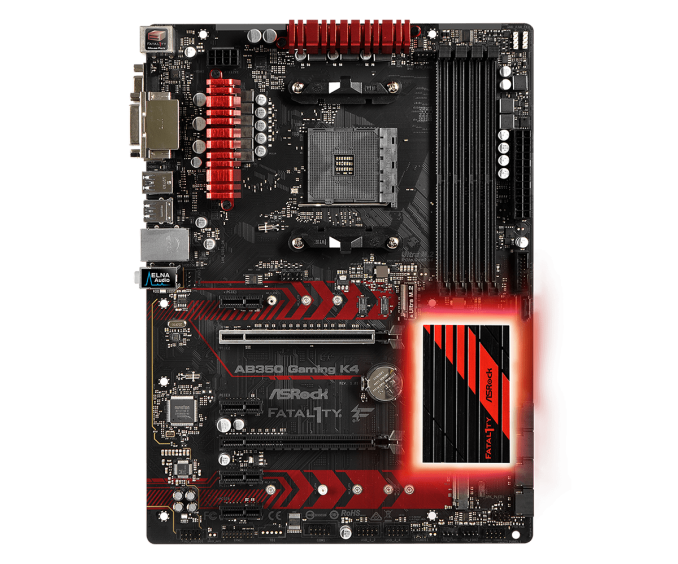 Today we are testing the ASRock AB350 Gaming K4 motherboard, coming in under the radar just below $90. It offers almost everything its bigger cousins provide except SLI, but single GPU users can find a home with a motherboard like this one. Our aim today is to ascertain whether the ASRock AB350 Gaming K4 can be a top value proposition with the B350 chipset in play. To read specifically about the X370/B350 chip/platform and the specifications therein, our deep dive into what it is can be found at this link. Most of the world who own desktop computers typically have something very simple. A mid-range CPU, no overclock, a discrete graphics card, one or two storage devices, a modest memory, and a mouse/keyboard. Everyone likes to talk about the halo, but the reality is that the bigger battlefield is in the lower ranks. To that end, both major players offer non-overclockable mid-range CPUs, and also mid-range chipsets for motherboards that target a lower cost segment. A few of the extra features might be reduced, such as high-end USB ports, storage options, or SLI, but the benefit for the simpler system is lower cost, especially when in these markets, cost is a big factor in gaining market share. So alongside AMD's high end X370 is the more mid-range B350 and A320 chipsets, showing an awesome PC for most people doesn't have to empty the bank account. With the ASRock AB350 Gaming K4, as the name seems to imply, ASRock wants it two ways: a competitive gaming motherboard in the B350 chipset space. No idea why it is called the 'AB350', that's just something ASRock seems to do, but the goal of the board here is to target the gaming crowd. That means having a relatively fully black PCB, a set of red aluminium heatsinks, and a full-length PCIe slot for graphics that has extra reinforcement to take the toughest pixel pushing PCIe powerhouses. The top full-length slot runs in PCIe x16 mode from the CPU, while the second slot also from the CPU, but is limited to PCIe x4, and shares bandwidth with one of the M.2 slots. Focusing on the storage, a total of six SATA 6Gb/s ports are present with four of them are angled at 90 degrees at the bottom right hand side of the board. The remaining two are straight angled and can be found towards the integrated USB 3.0 front panel header (at the foot of the four RAM slots); these two ports are powered through an ASMedia ASM1061 controller. 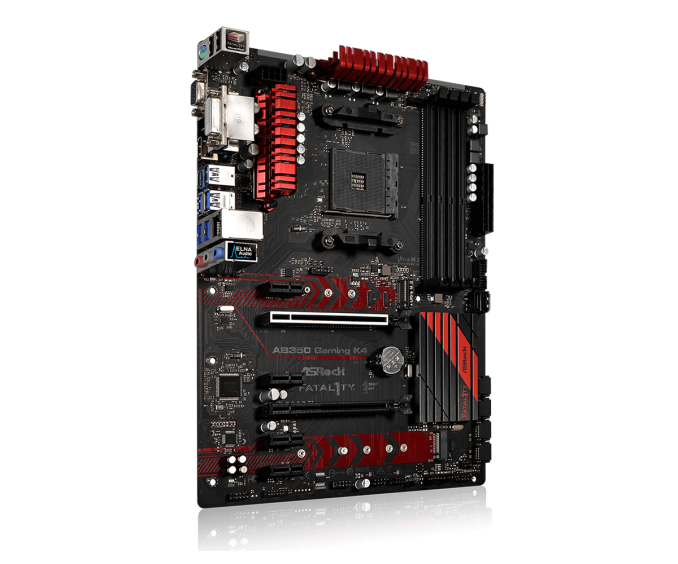 The AB350 Gaming K4 has two M.2 slots, with the top one above the reinforced PCIe x16 Gen3 slot coming from the CPU, sharing PCIe lanes with the second full-length PCIe slot, while the second M.2 slot is a SATA-only slot. It's a shame that they both aren't PCIe, but still there are not many sub-$100 motherboards that will happily take two M.2 storage drives as easily. The AB350 Gaming K4 does favour some of the more budget focused controllers, which which is to be expected on a sub $100 offering, but this means the onboard audio usese the Realtek RTL8111 networking chip and the Realtek ALC892 audio codec, often bundled at a discount for OEMs. The audio solution is reinforced by ELNA audio capacitors, as well as some degree of PCB separation to ensure there is no interference between the analog and digital signals in close proximity. Despite the chipset supporting USB 3.1 (10 Gbps), ASRock saves some effort in the mode complicated traces by relying on USB 3.0 instead - with five Type-A ports on the rear, a Type-C port on the rear enabled by an ASMedia ASM1543 redriver, and a single USB 3.0 header. Everything else is USB 2.0. Despite this board, at this price point, is not exactly feature rich as shown by having only the four 4-pin fan headers. That being said, the dedicated CPU fan header does have support for a maximum power rating of 1A/12V, allowing for high-powered fans or pumps, and the other three fan headers are capable of automatically detecting if PWM or DC fans are connected. Price wise, the ASRock AB350 Gaming K4 currently retails for a modest $90. This technically makes it one of the most expensive B350 motherboards on the market, however the value proposition is when comparing it to its more expensive X370 brethren. 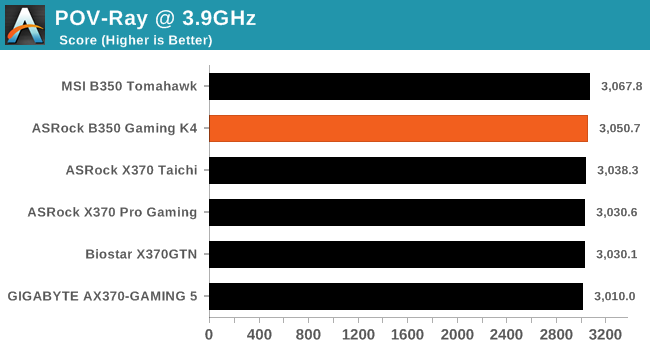 For the majority of gamers, such as those that do not need SLI support, the Gaming K4 has a lot to offer by shaving off some of those top tier items, but also comes bundled with ASRock's gaming software and capabilities. In the benchmarks, it draws close parity to its more expensive cousins, and even passes a good overclock. Why spend $250 on features the user might not need, when with a $90 motherboard the system can still offer a hefty punch - especially if that gets reinvested in a better GPU. Usually cheaper motherboards could lead to a variety of overclocking issues. For example, the power delivery could use cheaper components, resulting in a lower overall efficiency. This would empty more thermal energy into the heatsinks, and if the heatsinks are also similarly less performant due to cost, it compounts the issue. If the motherboard has fewer PCB layers, designers often have to make compromises on trace layout, which can also reduce potential peak frequencies. Luckily, on the AB350 Gaming K4, overclocking was as easy as any of the X370 motherboards we have tested. The UEFI BIOS is very intuitive to use, and is one of my favourites so far out of all of the B350 based motherboards we have tested. One could quite easily forget that this isn’t actually an X370 motherboard in terms of performance, style, design and colour scheme. From our previous testing, our Ryzen 7 1700 CPU has a limitation between 3.9 GHz and 4.0 GHz. Despite the hub-bub over 4 GHz and above Ryzen chips, while 3.9GHz seems meagre, in the full spectrum of the silicon lottery it is actually reasonable for a Ryzen 7 1700 chip. Even at 3.9 GHz, the performance is consistent within our testing perameters, with the chip pushing close to 190 W at the wall under OCCT. The Ryzen 7 1700 processor we are currently using has a 3.0 GHz base core clock with a turbo clock speed of 3.7 GHz, and has an on-the-box TDP of 65W. When overclocked to 3.9 GHz with 1.375 volts, the overall power consumption taken at the wall was pushing just under 189W at peak, but it sailed through our testing. Isn't it strange to have a whole series of reviews planned for this generation of AMD motherboards right now? A new motherboard (and processor) generation is expected to launch within the next 2 to 3 weeks. This ASRock AB350 should be forwards compatible (with a BIOS update), but wouldn't people buying a new motherboard be better off buying one with a newer chipset from the upcoming generation? Welcome to AnandTech anno 2018 - so perpetually late with certain reviews that it's often a wonder they bother putting them up. I guess Purch, "The Future of Digital Publishing", can't afford to hire more writers (because they sure as hell can't afford editors worth a damn, as shown by the ever-increasing amount of basic grammar and spelling mistakes in the articles that do get put up). If you see any errors or typos, please by all means let us know. "A mid-range GPU, no overclock, a discrete graphics card"